The Culinary Historians of New York present Dates in "Medieval Baghdad: Sweet Eats to Heady Drinks." Discover how medieval Baghdadi cooks and wine makers exploited the date, from its versatility as a sweetener to its ability to produce highly intoxicating wines. The lecture will be led by native Iraqi Professor Nawal Nasrallah (author, Delights from the Garden of Eden: A Cookbook). 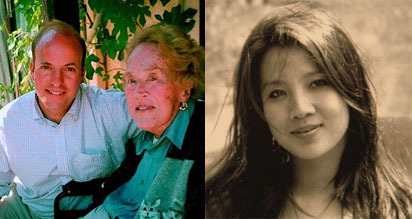 The event will take place at the National Arts Club (15 Gramercy Park South) on Monday, May 5th with check-in and reception at 7:30 p.m. followed by the lecture at 8:00 p.m. Tickets available through Brown Paper Tickets. $40/non-members and guests, $25/members, $22/students and seniors. I raved earlier about Southern Alps Slow Dried Fruits when I spotted them at last year's Fancy Food Show. 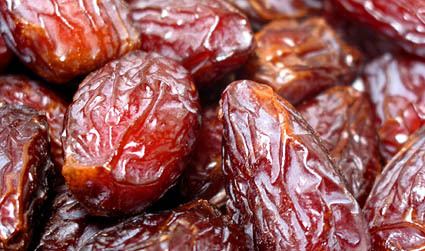 Unlike other dried fruits, these contain no sugar, sulfites, or other additives and preservatives. The result is visually stunning, not to mention tasty. The mangoes, for example, have a distinctly sour and sweet flavor, and a very chewy, leathery texture (almost like beef jerky) that's nothing like the sugary sweet kind you might find in Chinatown grocery store. Mango, mulberries, pineapple, green apples, figs, and strawberries, among other fruits, are also available in snack size pouches. $4.99 to $7.99 each at iGourmet.com. Brooklyn's Montauk Club will launch its monthly series, "Facts & Fictions," with readings from authors Alex Prud'homme (My Life in France) and Kim Sunée (Trail of Crumbs: Hunger, Love, and the Search for Home). The free event will take place Wednesday, April 23rd at 7:00 p.m. at the Montauk Club (25 8th Avenue, Brooklyn). For more information, contact montaukreadings@gmail.com. Last week's Passover conundrum, about what to make for a Passover dessert among so many interesting recipes, was narrowed to two final selections. I wanted to make something out of the ordinary, and the results were successful. 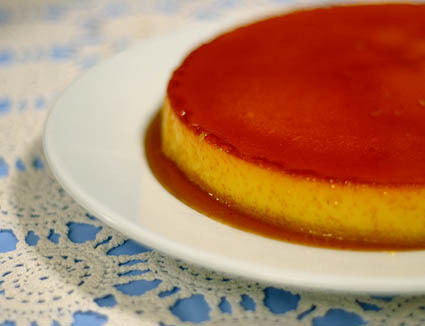 Above is a Spanish orange-almond flan, adapted by Joan Nathan from a recipe by Ana Bensadón. Somehow, I averted what I thought would be a complete disaster during the cooking process and somehow produced a pretty incredible dessert, worthy of making not just for the Passover holiday, but any time...you have a dozen eggs to spare! 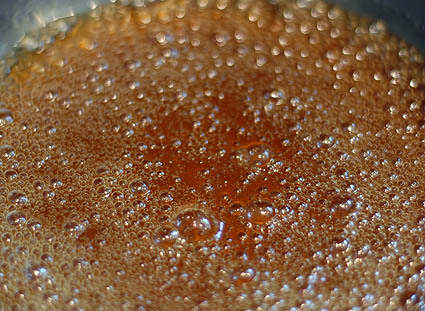 The disaster part came while cooking the flan in the oven, which was a surprise, since I successfully navigated the toughest step in the recipe: making caramel for my very first time (seen bubbling away below). 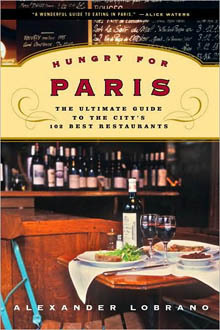 Hungry for Paris, a new guide to dining in Paris, provides reviews of more than 100 restaurants in the French capitol. Organized by neighborhood, with maps detailing each restaurant's location, the reviews provide deeply personal evocations of favorite eating places (but, if you're in a rush, "In a Word," bite-size reviews follow each entry). The author, Alexander Lobrano, longtime European correspondent for Gourmet magazine, is clearly smitten with the city, but don't think the book is mere boosterism. He writes despairingly that brasseries are on the decline and includes an honest appraisal of why some of the more famous Paris restaurants you've heard about didn't make the cut. The reviews are bookended with short, useful essays on the basics of French dining, eating alone, seasonal specialties, and learning how to eat the "unspeakable" -- snails, smelly cheeses, frogs' legs and other foods that freak Americans out. "Why fly all the way to Paris to eat chicken breasts or steak?" asks Lobrano. "Push your limits instead. At worst, you'll have a gruesome gastro tale of your own to recount when you get home. More likely, you'll be amazed to discover that you actually like pig's feet, beef muzzle salad vinaigrette, and calf's brains." $10.88 at amazon.com. Desiring something different than the ubiquitous (but always delicious) flourless chocolate cake, I have been searching for something entirely new to make for Passover dessert this year. 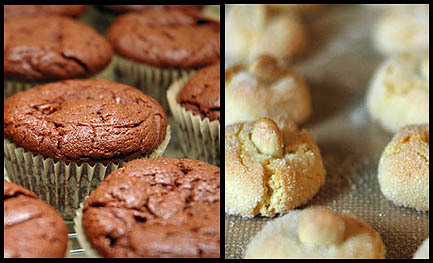 I've had some success in Passovers past making Le Pain Quotidien's Belgian Brownies (above left), rich chocolate mini-cakes that, surprisingly, don't suffer at all from the absence of flour, as well as Joan Nathan's almendrados (above right), Spanish almond macaroons with a hint of lemon. Sakura, the cherry blossom, is the national flower of Japan, and its annual bloom season is a cause for celebration throughout the country and the world. New Yorkers can celebrate cherry blossom season with a Sakura Festival at EN Brasserie (435 Hudson Street). To replicate an evening of dining under pink cherry blossoms in Japan, the restaurant will be decorated in with the blooming flowers. As part of the celebration, a special Sakura Kaiseki menu will highlight seasonal Japanese delicacies, incorporating the delicate blossoms within the dishes. The festival will take place beginning on Monday, April 21st, and will last through to Sunday, May 4th. Sakura Kaiseki menu: $80/person. Reservations: 212.647.9196. Joerg Gaetjens' Chalkboard Napkin Rings not only spiff up your table setting, they also function as reusable place cards. Write the names of your guests on the napkin rings with a slate pencil and erase with the sponge eraser (both included). While they may be pretty nifty, the price ($65) seems a little steep. After all, you could simply pick up some unfinished rings and chalkboard paint and make your own on the cheap. $65 for a set of four at MoMA. Design site Core 77 points to writer and designer Christopher Salyers' Face Food: The Visual Creativity of Japanese Bento Boxes, a collection images of the creative and complex brand of bento boxes known as charaben, where rice, tofu, seaweed, and other foodstuffs are transformed into kids' lunches inspired by anime, television, and movies. 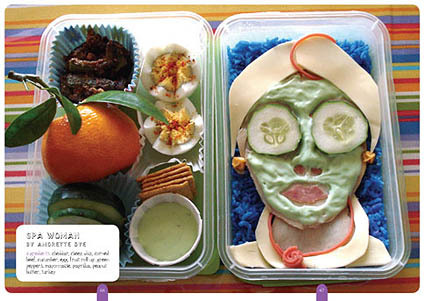 In addition to photography, the book includes a bento "how-to" and interviews with charaben enthusiasts. Salyers' writes: "For all of you who have ever eaten or prepared a slap-dash PB&J sandwich, or have been victim of school cafeterias, I offer up these pages as proof that when you show this much dedication to what you or your child eats, the end result will be nothing short of astounding." $10.15 at amazon.com. The human tounge senses five tastes: sweet, salty, bitter, sour, and umami. 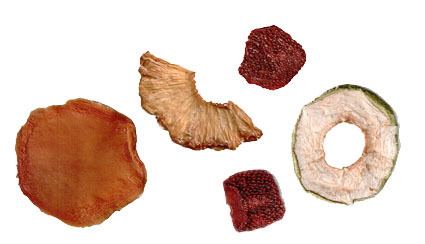 Umami is a Japanese word meaning "savory" or "meaty" and applies to a sensation common in meats, cheese, and other protein-rich foods or to "earthy" foods such as mushrooms and soy sauce, high in glutamates. The Umami Festival comprises a series of tastings, workshops, and performances aimed at bringing together artists and culinarians who use food as a medium. The Umami Food and Art Festival will take place Tuesday April 8th through Friday, April 18th at Roulette (20 Greene Street). For a full list of events, ticket prices, and more information, visit the offical site.